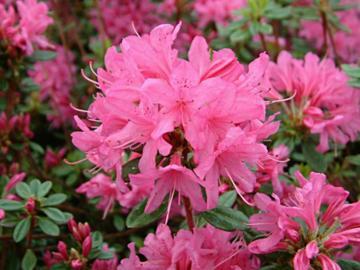 Very compact, Azalea-like small shrub. Small, tightly clustered, dark green leaves becoming purple tinged in cold winters. Covered by abundant clusters of small, deep pink flowers in spring. Intersectional cross of R. racemosum x R. 'Hinodegiri' (Evergreen Azalea). Raised in in Boskoop, Holland.